I am a 25 year old who was diagnosed with Breast Cancer in October 2006, and I contacted Challenge Cancer through Adventure during my treatment. I wanted to do something exciting to mark the end of the chemotherapy and give me something to look forward to and aim for. 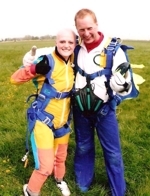 Consequently on 21st April 2007 I jumped out of a plane at 12,000 ft high and have never had a feeling quite like it! Every time I watch my experience on DVD it makes me cry, to describe it in one word would be: MAGIC. It meant so much to me and I loved it, I have Challenge Cancer through Adventure to thank for that and helping me throughout this journey.